Over the past few years, I’ve owned a lot of Bluetooth speakers. In fact, I’ve found myself in the market for a new Bluetooth speaker more often than I would like, for a variety of reasons. In some cases, I was careless enough to get sand or water in the speaker; in others, the speaker was damaged beyond repair by outside forces (more on that later). Most of the time, I was secretly relieved that I needed a new speaker, because the one I was replacing didn’t provide the sound quality I needed to properly enjoy my music. Bluetooth speakers are fast becoming the preferred audio option for many consumers: they’re portable, compatible with nearly every phone, and are a breeze to use. But while those are important, the primary focus for most users is the quality of the sound. Sure, there’s bound to be a drop-off in sound quality from a hi-fi audio system with surround-sound speakers. If you’re like me, you aren’t expecting a Bluetooth speaker to offer the same sound quality as a full stereo system, but you are expecting that the speaker won’t make your music sound like a tinny mess when you use it. That said, I don’t know about you, but I can’t afford to spend hundreds of dollars on high-end Bluetooth speakers – especially with my habit of having to replace them every few months. As a musician and a music lover, I have a finely-tuned sense of how a song is supposed to sound (the way it does through my noise-canceling headphones), so I also need a Bluetooth speaker that doesn’t diminish the quality of the music when I use it. There is no easier way to ruin my enjoyment of a song than by listening to it through a speaker that can’t properly capture all its elements. But as important as quality is, I also need a speaker that won’t completely drain my wallet. I’ve dabbled with a variety of Bluetooth speakers in the past, and most of them have come up short in one way or another. Some speakers have crisp mids and highs, but can’t handle the low end frequencies, making them great for quiet listening but a rumbly, staticky mess when I turn up the volume. Others are better-equipped for the low end, but sacrifice clarity on the middle and higher frequencies, muffling the overall sound and leaving me feeling like I’ve been stuffed in a car trunk next to a subwoofer. Until recently, I thought that was just the trade-off I’d have to accept, at least until I could afford a top-of-the-line Bluetooth speaker. And then I found the OontZ Angle 3 from Cambridge SoundWorks. The Cambridge SoundWorks name has long been synonymous with high-quality audio. When I was younger, a Cambridge hi-fi system was the cream of the crop, the kind of stereo you could buy once and hang onto for the next 30 years. At first, Cambridge SoundWorks resisted dipping their toes into the Bluetooth speaker market, preferring instead to maintain its focus on hi-fi stereo systems. But as the demand for hi-fi stereos has dwindled, Cambridge SoundWorks had to adapt in order to survive. Their first rounds of Bluetooth speakers (the OontZ Angle 1 and OontZ Angle 2) were well-received: they offered comparable quality to bigger-name Bluetooth speaker companies like Jawbone and Bose, but at a fraction of the price. The biggest problem with their first two speakers was striking the right balance between clarity and bass, but with the OontZ Angle 3, Cambridge SoundWorks appears to have solved that mystery. There are three versions of the OontZ Angle 3, all with varying features: the OontZ Angle 3, OontZ Angle 3 PLUS, and OontZ Angle 3XL. (Since I only own the standard OontZ Angle 3, I’ll do my best not to speculate about the performance of the 3 PLUS and the 3XL.) Each of the speakers are compatible with IOS and any other Bluetooth-capable smartphone, so no matter what kind of phone you have, rest assured it’ll work with the OontZ Angle 3. And if you have an Echo Dot or a Kindle, the OontZ Angle 3 will work with those devices as well. Pairing can sometimes be a bit of a hassle if there are multiple phones connected to the speaker. The OontZ Angle 3 tends to automatically pair with the last phone that used it, and unpairing that phone/pairing a new one can get a bit frustrating at times. That said, that seems to be a pretty common issue among most Bluetooth speakers. The OontZ Angle 3 also doesn’t have the option to change tracks or adjust the volume on the unit itself — all it has is a Play/Pause button. So if you’re the kind of person who leaves their phone in another room and wants to control the music from the unit itself, you’ll probably need the PLUS version or the 3XL version (both of which also offer track back/track forward options on the unit). The OontZ Angle 3 has a maximum volume output of 10 Watts, which is plenty for small to medium get-togethers. And though you would expect the quality of the bass to diminish in proportion to the volume, the Passive Bass Radiator in the OontZ Angle 3 offers better bass quality without sacrificing the necessary clarity to fully enjoy your music. If you have a massive house party, you might find it a little hard to hear the lyrics or higher-end frequences over the din, but having used it firsthand at my own parties, I can attest that you’ll still be able to hear the powerful bass tones over the noise. 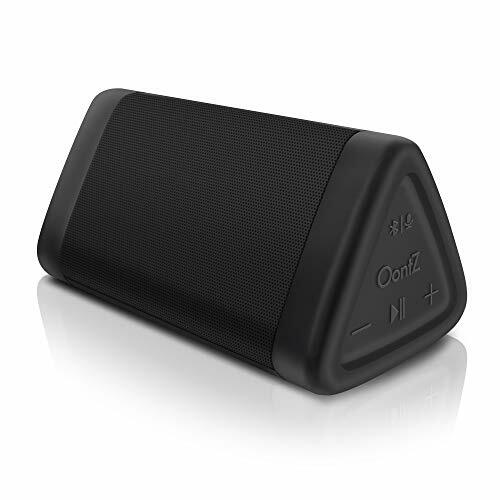 Like many other Bluetooth speakers, the OontZ Angle 3 can also be used as an auxiliary speaker for phone calls, and it performs admirably in this regard as well. Phone calls are about as clear as they are with headphones or your phone’s handset function, but I’d advise not straying too far from the speaker when you’re on phone calls: it makes a better speaker than a microphone. As I noted above, one of the key selling points of any Bluetooth speaker is portability. We’re past the days of the D-battery-powered boombox on your shoulder; a good Bluetooth speaker should have enough heft to it that you know the materials used in its construction are high-quality, but shouldn’t be so cumbersome that you feel weighted down by it if you’re carrying it in a backpack. Frankly, the amount of punch this speaker packs is remarkable given its unobtrusive size. The OontZ Angle 3 is quite compact: it measures 5.3 x 2.6 x 2.8 inches and weighs only 10 ounces, making it slightly heavier than an iPhone 7 Plus. Cambridge SoundWorks does offer a carrying case for the OontZ Angle 3, but for the budget-conscious, it’s probably an unnecessary expense. If you wanted, you could easily fit the OontZ Angle 3 in your pocket for easy transportation — no shoulder-mounting required. The battery life on the OontZ Angle 3 is good, but not great: it offers up to 12 hours of continuous use, which is solidly in the middle of the pack in terms of its competitors. If you’re planning a weekend away, you’ll want to keep an eye on the battery and be sure to bring the micro USB charging cable with you to ensure the battery doesn’t die during use. Unfortunately, the OontZ Angle 3 does not offer a replaceable battery (the 3XL version does), so you’re stuck with the one you have. Remember how I said you probably won’t need the carrying case? Well, that’s partly because the OontZ Angle 3 features an IPX5﻿﻿ rating. It’s not designed to go in the water, and I wouldn’t recommend leaving it outdoors overnight, but you won’t have to worry about a little rain or sand ruining the unit. That IPX5 rating means the OontZ Angle 3 is splashproof, rainproof, dustproof and sandproof, which is about as high a rating as you can expect from a speaker that’s not specifically designed to go in the water. And from experience, those waterproof speakers are more concerned about durability than they are about sound quality, so while it’s nice to have a speaker that can float in the pool with you, it’s not worth the trade-off of the inferior sound. The OontZ Angle 3 is also built to withstand some minor dropping and mishandling — the rubber wrapping on the ends helps cushion the speaker from any unexpected falls, which is a great added benefit. To my dismay, however, the OontZ Angle 3 is not dog-proof, as I recently found out when I came back from a weekend away to find my speaker chewed to pieces and scattered around my apartment. It definitely makes a better speaker than a chew toy, despite what my dog Max might think. In fact, I can’t think of a better endorsement for the OontZ Angle 3 than the fact that I promptly ordered another one to replace the original after its untimely demise at Max’s hands (or teeth). If you’re looking to spend as little money as possible, there are cheaper options out there. But for the price, I haven’t found a speaker that strikes the balance of quality, durability and affordability that the OontZ Angle 3 provides. Ya, it is pretty indestructible. In the future, you may want to keep it away from bathtubs and toilets, though. Its IPX rating doesn’t hold up to submersion. What a coincidence! I dropped mine in the toilet as well…. Ryan is a Master's student in the Creative Publishing & Critical Journalism at The New School and is passionate about music. He has been playing the bass since 5th grade (first upright, now electric), and is constantly searching for new products to enhance both his playing and my listening experience.